Bluetooth speaker maker SpeeCup recently sent me their eponymous product. We’ll describe both their name and the product in one go – when you say SpeeCup, say it quickly and somewhat mute the ‘p’ and you’ll send up with something that sounds much like ‘speaker’. The ‘cup’ part is due to the SpeeCup being shaped like a large travel coffee cup. Clever. Of course, this is meant to fit in your car’s cup holder and it does in mine with a little room to spare, so no forcing it in or out. It’s heavier than it looks.It’s fairly large, so depending on your arm/hand antics in the car and where your cup holder is, you could potentially hit it a lot, knock it over or accidentally press its buttons. I was happy to see that it works ‘out of the box’ – I plugged it into the charger in my car, turned it on, paired it quickly and I was up and running, playing my podcasts through it, all within 10 minutes. The instructions were pretty minimal, mostly focusing on setup with an iPhone and Siri. In my case, since I tested it with my Android 4.2 Nexus, I didn’t really refer to those guides. However, with the exception of 1 little thing (turning on gesture control), I didn’t need them. At the very top of the SpeeCup are the iPod-styled dial controls. Rotate 15-20° to the left or right to turn the volume up or down. The audible cue on that is a very loud beep. See my comment on a firmware update/tweak to be able to modify that. Pressing down at the perimeter are a few controls – play, stop and phone answer/hang up. I think this needs a revision, because I ended up stopping my music/podcast playback a few times while trying to adjust the volume. The whole dial feels a little wobbly like it’s loose. At the side is the microUSB connector, as well as a standard audio jack for output. There is a ‘hard’ on-off button on the bottom of the SpeeCup. Battery life is rated at 20 hours, but if you really need to conserve that, you need to turn it off. I really wished there was a soft on-off button either on the top dial or on the side. Personally I found myself lifting it out of the cup holder to turn it on or off. 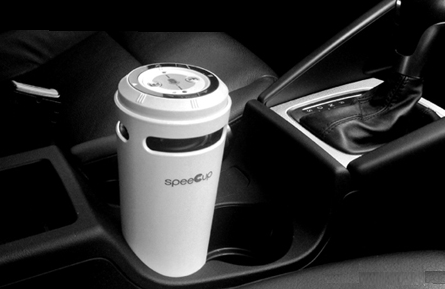 With apologies to SpeeCup for mangling their photo, but you can see here how it fits into your car’s cup holder. The SpeeCup works as a bluetooth headset, but in my tests, although audio on my end sounded perfectly fine, Chief Gizmateer said the first bit my speech was cut off. So when I’d start talking, he’d miss the first half a second or so, which made it tough for him to figure out until he got the whole context. Not a complete show stopper, but very distracting at a minimum. Not something you’d want to have a business conference call on. We ran a few tests with the same results. However, if I put my mouth right near to the mic at the top of the SpeeCup, he could hear me just fine. This got me to thinking that it’d be cool if I could update the firmware, should there be a fix for this audio problem. Audio quality for my spoken podcasts was nice and clear, not tinny, and more than loud enough for my car. However, don’t think you’re going to use this for music. I mean you can, but the quality isn’t there. You’re better off putting on cheap headphones. Now the SpeeCup does have a nice feature where it can act as a bluetooth speaker ‘proxy’. It has a standard 3.5mm audio output connector, so you can push audio to another speaker or audio system. i.e. 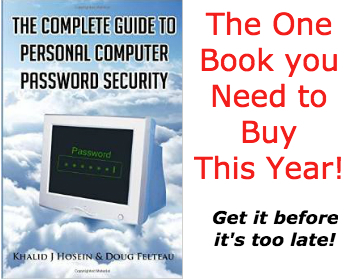 From your bluetooth source (phone, computer, etc. ), you can playback something like a phone call or a podcast via bluetooth to the SpeeCup which will in turn output it whatever speaker it’s hooked up to. Nice feature. The SpeeCup touts its Siri integration, just press the button in the middle and ask away. I did not test this with an iPhone, so I didn’t have a chance to test out the Siri voice control. Presumably it works just the same as Siri natively, although with the issue I had with the first piece of speech being cut off, this might affect Siri’s performance. To wit, when I tried this with Google Assistant, it failed repeatedly, which is too bad. I would have loved to be able to press the button to give instructions instead of having to fumble around for my phone. On the bright side, there is a lot of integration that works without any configuration. For example, I could use the hardware buttons on the SpeeCup to control Pandora, Doggcatcher (my podcast app) and Google Music. I could start and stop playback, skip songs in Pandora and while Doggcatcher won’t let me skip without pressing and holding, it did let me use them as fast-forward and rewind which was perfect for me. One neat little feature is the ability to answer or hang up calls just by waving your hand right over the SpeeCup. Sadly, I couldn’t get this to work either, but it wasn’t a show stopper. There is a button on the opposite side of the volume rocker to answer/hang-up calls, and that worked just fine. Although not widely available online currently, you can pick up the SpeeCup directly from their website for $129.95 in white, black or red. That price is in the range of other bluetooth speakers by Jawbone, JBL, Logitech, etc. While I enjoy having a speaker in my car so that I’m hands-free and don’t have wires dangling from my ears, I think the price may be just a bit too high. However, if SpeeCup can fix some of the issues I found, with the variety of features it has, they’re not far off. There is a lot to like especially not having to configure much if anything at all.